Reading Irish Kitchen Garden today I realised that although I've been growing Babington leeks for many years now it's been rather an academic exercise. I've planted them, tended them, distributed them and looked upon them more as novelty pets instead of seeing how best to incorporate them into a vegetable garden as a useful crop. These are my records on the subject, including today's tasting notes. Charles Cardale Babington (1808 – 1895) was a contemporary of Darwin. He was a botanist who studied at St John's College, Cambridge. He became Chair of Botany at the University of Cambridge in 1861 and in addition to many works of botany wrote several papers on insects. In 1833 shortly after completing his M.A. he was present at the foundation of the Royal Entomological Society. He continued to study and write papers on his interests until late in life. His papers and specimens are conserved by the University of Cambridge. I've not been able to determine exactly when his leek was named for him. 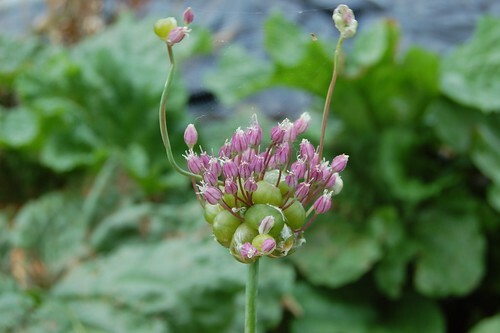 In 1840 he wrote about the differences between true leeks, Allium porrum, and Allium ampeloprasum in the ANNALS OF NATURAL HISTORY, mentioning that on Guernsey he had seen Allium ampeloprasum reproducing from bulbils produced on the flower head. 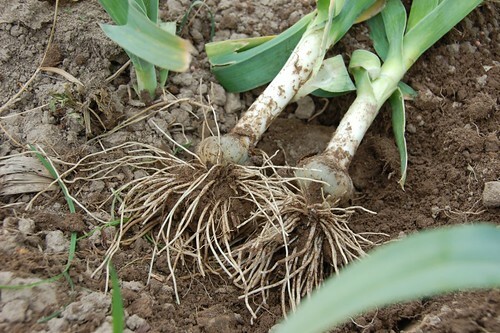 Babington's Leek is a perennial sterile plant that reproduces only by means of root offsets and the bulbils formed with the flowers. Studies have indicated that all specimens found in Britain and the Channel Islands are from a single clone. The plant is also found in Ireland although opinion is divided as to whether it's native there or perhaps introduced. It is found mainly in the S.W. of England preferring an open environment on sea cliffs, coastal heaths and woodlands. It has no particular preferences for soil type as long as it is free draining and sunny. The plant comes into growth in early spring, forms a leek like leafy top growth and follows this with a tall flower stem in July. The florets are pale purple but the main part of the head is formed from small bulbils which start green and gradually harden up with a brown skin like tiny misshapen onions. In times of drought it may miss flowering and simply die back underground until there is sufficient moisture again. There are few indications that it has ever been domesticated or used for food by foragers but in recent times its oddity has become popular with gardeners who have kept it going by swapping material amongst themselves. It is now becoming commercialised by marketers keen to cash in on this. However, given its peculiar method of propagation it's unlikely that any improved varieties or better selections will ever become available. Start the bulbils (or are they really topsets?) in small pots of loamy compost in the spring. They are small and slow growers to begin with and it's easier to keep a track of them in pots than the open ground. The first year they will grow up like grass, before dying back over the winter. In the second year they start to display their leeky heritage. Plant them out in good soil and allow to grow on. Keep them weed free, like all alliums they hate competition. It's at this point you might consider taking a harvest but it's tempting to let them have another year in the ground. If you're lucky they will flower giving you a new source of bulbils for the next season. Mark the row before they die back or you'll lose them. If the season is damp you might find that they also make offsets at the base, another way of increasing stocks. The raw taste is more garlicky than leeky, quite spicy hot. I used my stems in a potato soup and the flavour mellowed a bit in the cooking but I think they would work well anywhere you might use green garlic or scapes. Somewhere along the line I got the impression that they are tolerant of competition. I've been growing them interplanted with strawberries where they seem to do okay, and may perhaps provide some alliumesque fungicidal protection for the strawbs. Certainly in the wild they seem to manage quite well but I think for 'proper' cropping you need to keep them reasonably clean or they never really produce much of a stem. I am somewhat on the fence about companion plantings of all sorts which might make a post for another day. However, this year my strawberries are sited next to the elephant garlic so observations will be made! Great pictures cat. 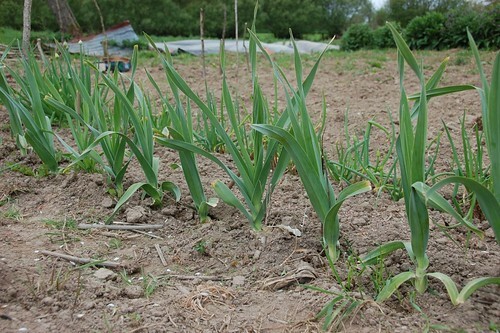 My Babbington Leeks have sprouted and I will write about them again soon and put a link to this post. While i have you, how do you subscribe to this blog, I don't see a link? Glad you found it, Peter. hi where could i find bulbs to buy ?